The horse has always been associated with royalty, and rock royalty is no exception to the rule. In the history of rock and roll, there are many royals, but only one King: Elvis Aaron Presley. One of the few remaining aspects of a life that is so otherwise so well known is his love of horses and riding. Lesley Pilling believes that Elvis spent his happiest times away from the celebrity circus, with his horses on his ranch, the Circle G. Lesley is now on a quest to bring the place where he was most at home back to life, with the intention of making it a welcoming communal venue for visitors, locals and the disadvantaged. Lesley talked to Miriam Bibby about Elvis, the man, his horses, and her vision for the future of the Circle G Ranch. Miriam Bibby: Lesley, welcome to History on Horseback. Please tell us something about the Circle G and what it meant to Elvis. Lesley Pilling: Thank you Miriam, it’s a pleasure to speak to you about Elvis, his love of horses and the Circle G Ranch. The Circle G Ranch is located about 15 miles south of Graceland (Elvis’ home in Memphis TN) in a place called Horn Lake just over the border in Mississippi. 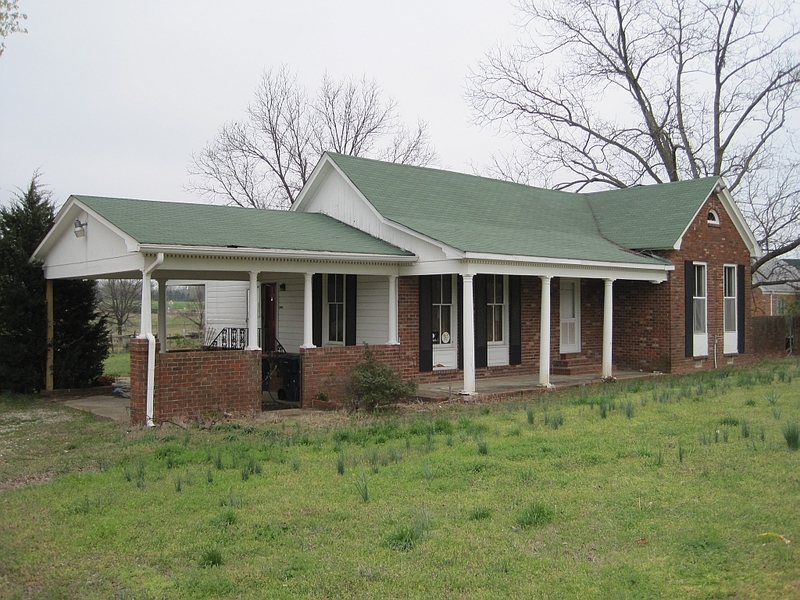 Elvis bought the ranch in February 1967. He first saw the ranch (then named Twinkeltown Farm) whilst out on a horse buying expedition. Driving by the ranch Elvis was attracted by the 75 white cross which was illuminated at night. As Elvis was quite a spiritual person and he was also looking for a place to house his ever increasing stable of horses, seeing the ranch for sale – Elvis being Elvis, bought the 163 acre property there and then – complete with its own herd of Santa Gertrudis cattle. Elvis wanted to register the ranch as The Circle G, but as this name was already taken he registered it as The Flying Circle G – although to Elvis and his friends, family and fans it has always been known as The Circle G Ranch. Elvis’ ownership of the ranch took place at a time of great change in his life. In May 1967, after owning the ranch for around 4 months, Elvis married Priscilla in Las Vegas – they then returned to Memphis and moved onto the Circle G for the main part of their honeymoon. Priscilla is quoted as saying this was probably the happiest time of their married life. She got a chance to cook and clean and just take care of Elvis; they could actually be just a normal couple and she felt that Elvis was able, for the first time, to find peace at the ranch. Shortly after this Elvis would have found out that he was to become a father – another milestone in his life. His movie contracts were also coming to an end and we understand that the peace and freedom that the ranch afforded him enabled him to think very seriously about the direction his career might take in the coming years. The ranch was a place where Elvis could escape the pressures of being ‘Elvis Presley’ and simply be a normal guy, hanging out with his friends and family and riding his horses. MB: From your description, the Circle G and his horses were at the heart of Elvis’s life. The Circle G was clearly a place where he felt truly at home. Do we know when Elvis first rode a horse? What do we know about his relationship with them? LP: Elvis loved horses. 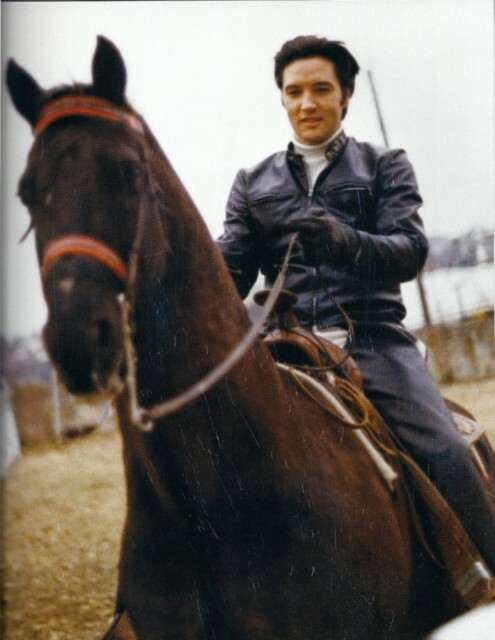 Although we’re not exactly sure if he had any experience of horses during his childhood years in Tupelo or Memphis, we do know that he rode horses as early as 1956 and at that time also spoke of his desire to own his own ranch. The collection of horses at Graceland began Christmas 1966 when Elvis bought a quarter horse named Domino for Priscilla as her Christmas gift. His enthusiasm for horses grew rapidly as he bought horses for his friends and family and soon the stable at Graceland was bursting at the seams. We do know that Elvis loved to care for his horses and there are documented tales of the time and love he took in doing so. It wasn’t at all unusual for him to walk his horse Rising Sun for an hour after riding him for just 15 minutes just to make sure that the horse wasn’t harmed in any way. Elvis loved to work on his own tack – those times alone with his horses allowed him the peace and serenity that his hectic life style didn’t usually permit. MB: How many horses did he keep on the ranch; and did he have favourites? LP: We believe that Elvis kept over 24 horses on the Circle G – although we’re still researching. We recently spoke to a gentleman who sold Elvis horses and equipment and we’re constantly reaching out to acquire more information for our Circle G Memory Bank. His favourite had to be his American Quarter Horse, a Golden Palomino named Rising Sun. Most of the photographs you see of Elvis on horseback show him on Rising Sun. He loved that horse and Rising Sun loved Elvis. He did own another memorable horse, Bear – a beautiful black Tennessee walking horse. Elvis Presley’s favourite horse was the palomino Rising Sun. Priscilla Presley wrote: “I remember one day I happened to look out of the window. It was twilight. The sky was aglow in misty blue and radiant pink. There was Elvis walking Rising Sun, his Golden Palomino. I saw them as silhouettes against the darkening sky. Elvis was walking slowly, I could practically hear him breathe. His breath was easy, his body relaxed. MB: What role did horses play in Elvis Presley’s professional life, in music and movies? LP: Some of Elvis’ best known films featured horses – Love Me Tender, Flaming Star, Stay Away Joe and Charro. 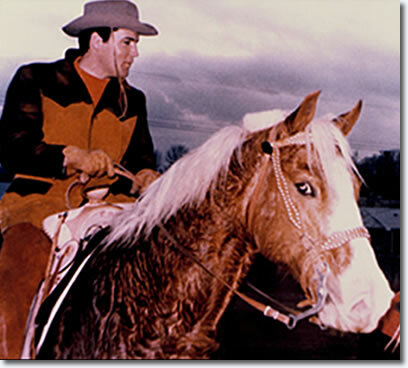 There was one hairy moment during the filming of Flaming Star when a horse ran away with Elvis – this understandably shook him up for a while but he quickly overcame his fear and was over it long before he bought the Circle G.
MB: It’s astonishing now to think of the many achievements of his all too brief life. What happened to the ranch after his death? LP: Yes, Elvis achieved so much in a relatively short period of time. The world is aware of much of that but there is so much more to the man than is generally talked about. Elvis was a very spiritual individual who was constantly searching and learning. He had a deep faith and the Circle G resonated with him for that reason. Even today when you stand and look at that 75 foot white cross that first drew Elvis there you can feel that calm and peace that Elvis did. Elvis also did a great deal for charity, much of it anonymously. Here at the Circle G Foundation our aim is to continue his charitable and humanitarian legacy at the ranch. At the time of his passing Elvis didn’t own the ranch. Although we do have documented statements that he continued to visit the property throughout his life and spoke to friends and family about it fondly. The ranch has been in private hands for many years. We believe this is our chance to return Elvis’ spirit there and in doing so continue his legacy of helping those less fortunate. MB: When you became involved with the Circle G, the germ of an idea began. How did your involvement come about? LP: I have been an Elvis fan since 1968 (aged 7) so obviously I’ve known about the ranch. I didn’t get to visit Memphis until 2008 and then it wasn’t until 2010 when I got the chance to visit the Circle G. Finding it in the terrible state it’s in reduced me to tears and I promised myself (and Elvis) there and then to do whatever I could to save it. On returning home I launched the campaign on Facebook. Now three years later the Circle G Foundation has supporters all around the world. We have a Management Team and 29 Ambassadors working hard to spread the word – and our support grows daily. MB: Since you first saw the potential in the Circle G, the possibilities have expanded immensely so that it’s now a very rich vision indeed. Tell us something about your plans for the future, and where you are currently. LP: Yes, since we began in 2010 our vision for the ranch has clarified and expanded. As I mentioned previously we feel this is the ideal location to continue Elvis’ charitable and humanitarian legacy. We would like to establish facilities for the disabled (hopefully riding for the disabled), help the disadvantaged by running programmes on the property and also establish rest and recouperation for service veterans. Of course it will be a wonderful site for Elvis fans to visit and stay but we also want to attract families to what will be a unique visitor experience. We are currently reaching out to potential investors who can help us achieve our dream. Although we realise that there is no quick fix and that such plans take time to come to fruition – we have achieved an awful lot in the past three years. Our profile both inside and outside the Elvis world continues to grow – and we hope that through interviews such as this we can reach out to the equine community, we’d love them to be involved. MB: Are you finding the support to bring this vision to reality, both locally and internationally? LP: One of the very special things about Elvis Presley is that he continues to be a global phenomenon. There isn’t a country in the world that doesn’t recognise his name and there isn’t a country in the world where you can’t find an Elvis Presley Fan Club! Here at the Circle G Foundation we work very hard on this ‘international’ fan base. We have our own Ambassadors in Australia, South Africa, Italy, France, UK, Canada, Belgium, Netherlands, USA, Denmark – so we have the world pretty well covered and we’ve had messages of support from every continent – so yes, we are finding that international support. That doesn’t mean we will stop reaching out – supporters are always extremely welcome and we love them to get in touch, no matter what field they come from or what nationality they are. If anyone does want to get in touch with us they can visit our website where they’ll find lots more detailed information, pictures and interesting items to look at. Use our Contact page to send us a message – we’d love to hear from your readers. MB: How do you think Elvis would feel about the project? What would he say? LP: This is a question we’ve asked ourselves many times. We hope that he’d be proud of his fans as we work towards continuing his charitable legacy on the ranch. We know he loved the Circle G and we want to return his spirit there. It’s a wonderful thought to imagine him smiling that million dollar smile and saying – ‘I have the best fans in the world! MB Lesley, thank you – good luck with your project! If any followers of History on Horseback would like to know more, or get involved, check out the project web site at http://www.circlegfoundation.co.uk and the Circle G Facebook page.